Eva Gabrielsson was recently in NYC to promote her new book “There are things I want you to know” about Stieg Larsson and me. Nearly 8 years since Stieg died, and 7 years since the publishing of “The Girl with the Dragon Tattoo”, Eva has written a book to set the story straight about their life and about Stieg. On his sudden death in 2004, after 32 years of their living and working together, Swedish authorities did not recognize Eva as the rightful heir of Stieg’s estate and the natural custodian of his creative work. The estranged father and brother of the author claimed everything. In fact lots of people claimed lots of things, and Eva had had enough. Obviously there was a lot of people who wanted to hear her story, as the book has been translated into 19 languages and published in 21 countries. I was interested to meet Eva in person not just because she had endured so much and refused to give up, but because of how she found a way to move forward with her life. Several weeks after Stieg’s passing, Eva summoned all her anger and fury about his death and the people and events that contributed to it by writing a curse. On New Years Eve she took direction from a collection of poems in Old Norse, and in the company of select friends, read her curse aloud in a magic ceremony. How good is that!? Nothing like a curse to give vent to all that negative energy and then move on. The more publicity the Millennium Trilogy and the story behind it receives, the more focus there is on the social issues so close to the activism of both Stieg and Eva, and on the current laws in Sweden governing spousal rights. Everything in the books, all the characters and events, were based on real life, and Eva was intrinsically involved in the reality ( if not the writing ) of this amazing work. So get your paperwork in order, make sure you have proof of your life and your intentions. Even though this picture is blurry ( Sean did not take it! ) 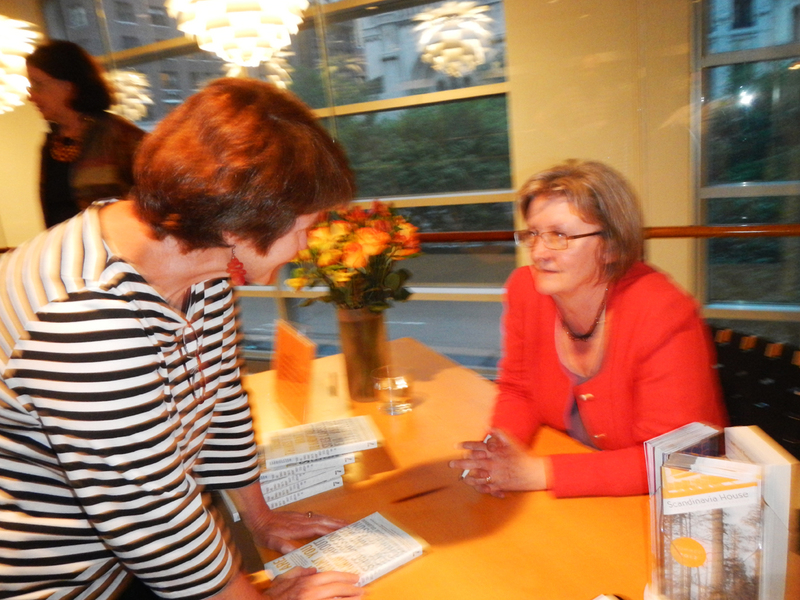 it is proof that I met Eva, and who knows, she may have told me what happens in the fourth book….. This entry was posted in art & inspiration, events and tagged Eva Gabrielsson. Bookmark the permalink.